The Monterey Bay and Pebble Beach area has been called the greatest meeting of land, sea, and sky, and is recognized as an ideal vacation and business destination.It is also a Mecca for golfers who want to walk in the footsteps of the greatest names to ever play the game. Within an hour’s driving distance of Pebble Beach there are some 20 golf courses, most of which are visually stunning and great fun to play. You may think that a private membership connection is necessary, but it turns out that many of these courses are open to public play, including three of the top public courses in the entire country. In fact, when Golf Digest Senior Travel Matt Ginella announced his 2008 list of the best public courses in America, his top three picks were all in the Monterey Bay area—Pebble Beach, Spyglass Hill, and his #1 pick Pasatiempo Golf Club. And because all 3 courses are within just a short drive of each other, you can play all three in a long weekend if you choose. Fly into convenient San Jose International Airport (SJC) on a Friday morning. Direct connections are available from most major U.S. cities. After you load the bags and clubs in the rental car you can take scenic California Highway 17 south over the Santa Cruz Mountains until you reach the Pasatiempo Drive Exit (about a 45 minute drive). Follow Pasatiempo Drive and the signs to the clubhouse. The dramatic 1st tee on the #3 ranked course of our trio awaits. As an alternative to San Jose International, you can also fly into San Francisco International (SFO) or Oakland International (OAK) which are located within 45 minutes of San Jose. Just head south from either airport toward San Jose to pick up Highway 17 to Pasatiempo. If you fly into SFO, the scenic-minded can cut across California Highway 92 to Half Moon Bay and reach the famous Coast Highway (U.S.1) for a leisurely drive south of about an hour to reach Santa Cruz, the home of Pasatiempo. 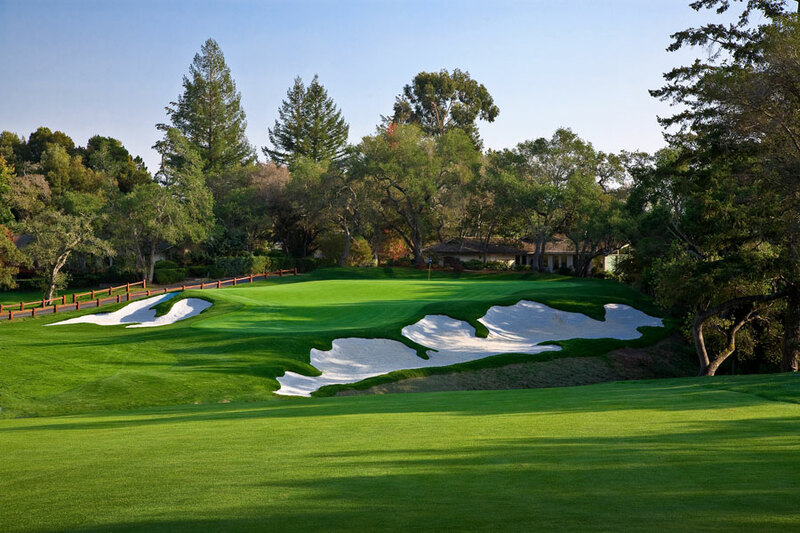 Set in the hills overlooking the city of Santa Cruz and with Monterey Bay and Pebble Beach in the distance, Pasatiempo is an Alister MacKenzie masterpiece. MacKenzie, who designed both Cypress Point and Augusta National, was so taken with Pasatiempo that he spent the last years of his life in his home along the 6th fairway. He described the back nine at Pasatiempo as the best nine holes in golf. The course is known for its undulating and tiered greens that make 3-putting more likely than you care to admit. This is most evident on the 18th where par is a great score. As you come in from 18 head up to the magnificent Hollins House (rated in the Top 50 U.S. 19th Holes by Golf Digest) for a bite to eat and a stunning view over the course and toward your next destination around Monterey Bay. After testing every aspect of your game at Pasatiempo, it's time to head down U.S. Highway 1 for the 50 minute drive to Monterey and Pebble Beach. Take the Pebble Beach/17 Mile Drive Exit and go straight through the traffic light. Then bear right to the Pebble Beach gate. Inform the guard that you are a guest at The Lodge and your entrance fee will be waived; follow the signs to The Lodge on 17 Mile Drive. For almost 90 years this exclusive resort has been world-renowned for exemplary service, breathtaking surroundings and incomparable golf. The Lodge's tradition of relaxed elegance in a stunning natural setting has earned it an international reputation for exceptional hospitality. With award-winning restaurants, superb accommodations, and a promenade of fine shops, The Lodge will not disappoint. Here you will find the Top 2 Courses You Can Play in California — #2 Spyglass Hill and the incomparable #1 Pebble Beach Golf Links. 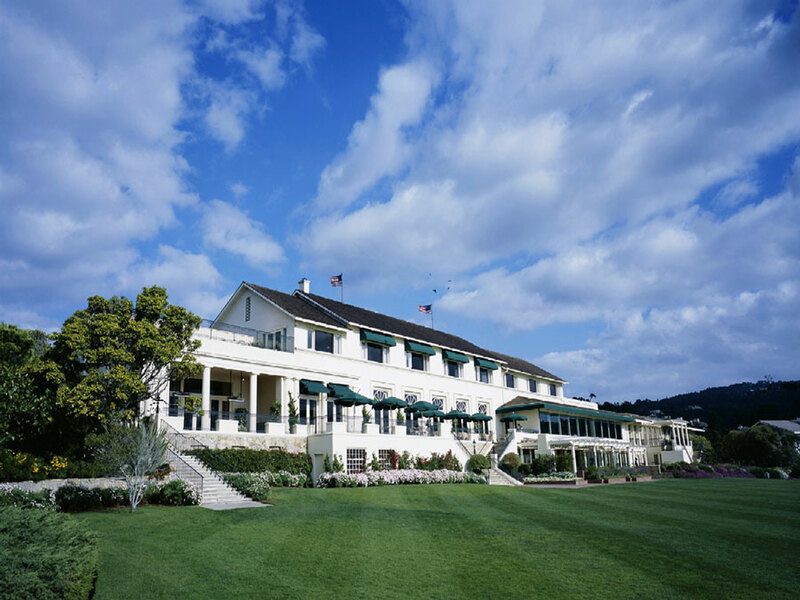 On Friday evening you can relive some amazing putts on the greens at Pasatiempo as you enjoy a meal at the Tap Room, a casual dining steak house at the Lodge with loads of memorabilia from the history of Pebble Beach. With Spyglass on the agenda for Saturday, you might just make a little history of your own. Designed by Robert Trent Jones Senior in the 1960's, Spyglass Hill is arguably the most difficult course on the Monterey Peninsula. The first six holes are close to the sea, and then the course turns inland with holes that are all tree lined with Monterey pines and visited by deer on the fairways. The course is long and you are usually hitting upwards to a raised green. Playing to your handicap at Spyglass is a real achievement and a great experience. On Saturday evening you may want to take the 10 minute shuttle over to the Inn at Spanish Bay, another of the great hotels at the Pebble Beach Resort. A good dinner choice here is the trendy Hawaiian fusion cuisine at Roy's, inspired by internationally known chef Roy Yamaguchi. Or if rustic Italian dishes are to your fancy, check out Peppoli's Tuscan cuisine, with sweeping views over the Links at Spanish Bay and the Pacific Ocean. Get a good night's rest for tomorrow is a Sunday you will never forget — golf at Pebble. Start your big day with the extensive Sunday brunch at the Stillwater Bar and Grill which overlooks the 18th green and Carmel Bay. Then a bit of a warm-up and your off to the first tee. Pebble Beach Golf Links was ranked the #1 Public Course in America by Golf Digest in 2007. Designed by Jack Neville and Douglas Grant, the course hugs the rugged coastline, providing breathtaking vistas, cliffside fairways, and sloping greens. It's a once-in-a-lifetime challenge. Pebble Beach has hosted some of golf's most prestigious tournaments, including the 1972, '82, '92 and 2000 U.S. Opens, along with the annual AT&T Pebble Beach National Pro-Am. Fantastic moments from Jack Nicklaus, Tom Watson, and Tiger Woods along with hilarious escapades of some celebrity amateurs are etched in the minds of most serious golfers. You will not forget your tee shot on the short 7th, your approach over the cliff on 8, maybe a chip a la Watson on 17, and cutting the corner a bit on 18, avoiding the world's largest water hazard on the left. After your round you can relax back at the Terrace Lounge overlooking the 18th and Carmel Bay, satisfied you have experienced the best — the Top 3 You Can Play in California — Pebble Beach, Spyglass Hill, and Pasatiempo ---what a way to spend a long weekend. Daytime temperatures vary from 50-75 degrees year round. Mornings can be cool and foggy while afternoons are frequently balmy. There is little rain from April to October. For those golfers who just can't wait ... start your play down at Spyglass Hill and Pebble Beach, and then head back up the road to Pasatiempo for your last round. Many Pasatiempo admirers will say you saved the best for last. For those golfers with friends and connections in high places ... take advantage of the area's private clubs ...perhaps the richest concentration of top private golf courses in the country, with Olympic Club, San Francisco GC, Cypress Point GC and Monterey Peninsula CC all in the area.